Hello on this beautiful Tuesday afternoon! 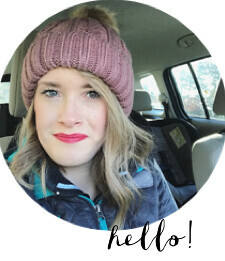 I have a fun feature to share today! Each week I will be sharing a Pint-Sized Moment - a moment from my life where being teeny tiny makes things interesting, awkward, funny, or unbelievable. Believe me, I have many of all of those types of moments. Just read what the top of the box says. Yup. The picture says it all. I was shopping for baby stuff at Walmart during my 2nd trimester and I ran across this little doozy. "Children 4'9" and under should use a booster seat." I am barely 4'8". I learned 2 things from this informative Walmart product: #1 - I am a child apparently. 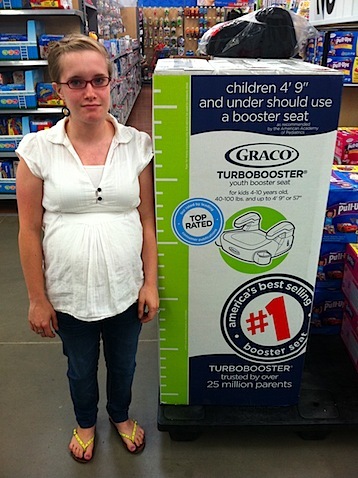 #2- I need to use a booster seat. To be fair, I rode in a booster seat much longer than most other children did, just ask my mother about how much I screamed in the car. But I'm going to look on the bright side: maybe Nicholas and I can get matching booster seats someday. Have you had any awkward shopping moments recently? I like your expression here. For a moment I thought the box said 'for kid 4-30 years old' and thought the manufacturers were really broadening their market!